Several widely used scoring systems for septic patients have been validated in an ICU setting, and may not be appropriate for other settings like Emergency Departments (ED) or High-Dependency Units (HDU), where a relevant number of these patients are managed. The purpose of this study is to find reliable tools for prognostic assessment of septic patients managed in an ED-HDU. 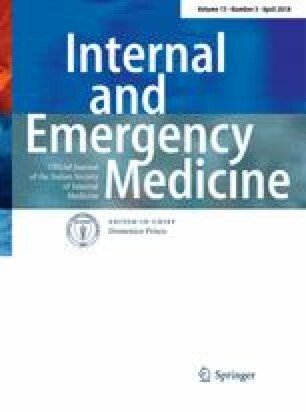 In 742 patients diagnosed with sepsis/severe sepsis/septic shock, not-intubated, admitted in ED between June 2008 and April 2016, SOFA, qSOFA, PIRO, MEWS, Charlson Comorbidity Index, MEDS, and APACHE II were calculated at ED admission (T0); SOFA and MEWS were also calculated after 24 h of ED-High-Dependency Unit stay (T1). Discrimination and incremental prognostic value of SOFA score over demographic data and parameters of sepsis severity were tested. Primary outcome is 28-day mortality. Twenty-eight day mortality rate is 31%. The different scores show a modest-to-moderate discrimination (T0 SOFA 0.695; T1 SOFA 0.741; qSOFA 0.625; T0 MEWS 0.662; T1 MEWS 0.729; PIRO: 0.646; APACHE II 0.756; Charlson Comorbidity Index 0.596; MEDS 0.674, all p < 0.001). At a multivariate stepwise Cox analysis, including age, Charlson Comorbidity Index, MEWS, and lactates, SOFA shows an incremental prognostic ability both at T0 (RR 1.165, IC 95% 1.009–1.224, p < 0.0001) and T1 (RR 1.168, IC 95% 1.104–1.234, p < 0.0001). SOFA score shows a moderate prognostic stratification ability, and demonstrates an incremental prognostic value over the previous medical conditions and clinical parameters in septic patients. The study is consistent with the principles of the Declaration of Helsinki of clinical research involving human subjects. Informed consent was obtained from all individual participants included in the study when they were called for follow-up.